Not more Widor, I hear you groan. Well, at least it’s not the Organ Symphony No. 5, with its overplayed Toccata battering your eardrums and driving out your neighbours. No, this is the second volume in Alba’s Historic Organs series featuring that fine Finn Jan Lehtola, whose Mendelssohn recital I welcomed so warmly last year (review) and whose BIS recording of Aho’s organ works was my Download of the Month (review). As if that weren’t enough I have his 4-CD Fuga set of Paavo Heininen’s organ music awaiting review. Regular readers will know how much I admire Fuga’s class-leading efforts in the genre, and they will be pleased to hear the redoubtable Mika Koivusalo is behind these Alba SACDs as well. Apart from being a splendid example of the marque, the Cavaillé-Coll in the Church of St François-de-Sales, Lyon – consecrated in 1880 – is remarkable for the fact that it has remained essentially unchanged since then. Aristide’s ‘symphonic’ instrument is credited with reviving French organ music in the 19th century, and Franck and Widor were quick to exploit its potential. 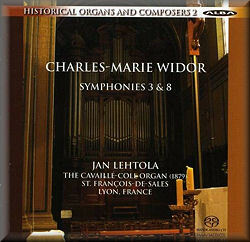 The latter’s first four Symphonies pour orgue show him in his formative, exploratory years, while the remaining six reveal his complete mastery of the form. The Prélude of No. 3 certainly pushes at the boundaries of what was possible at the time, with its translucent upper reaches, vast, rolling tunes and discreet but powerful pedals. As always with Lehtola the music advances without self-serving intervention or idiosyncrasy, and his judgements of pace and scale are impeccable. The warm, spacious yet finely detailed recording is as good as it gets, and the building’s acoustic ‘signature’ is retained without obvious manipulation or extraneous effects. In other words we hear a natural, well-balanced sound and a perfectly pitched performance. The turn-on-a-sixpence Minuetto is astonishing – the beast tamed, as it were – and the instrument’s dark, woody character comes across well in those light, filigreed tunes. Even when the beast is unleashed – in the monumental Marcia, for instance – there’s no sense of overload, musically or technically, and the telling inner detail of Widor’s score shines through at every turn. What a fine instrument this is, and how it seems we are there, pinned in a pew and awed by the panoply of sound. I say awed rather than cowed, the latter an adjective often appended to run-of-the-mill organ recordings for all the wrong reasons, most of them to do with excruciating sonics. Lehtola’s glowing Adagio, as plangently executed as one could wish, is yet another gem in a beautifully jewelled crown. As for the wont-to-wander Allegro molto, Lehtola maintains just the right degree of momentum and interest throughout. I can’t recall a more persuasive account of No. 3 than this, or a more perfect marriage of musicianship and recording technology. In the early days of digital audio critics spoke of a veil being lifted from the music; with hindsight that seems a little fanciful, but the very best Super Audio recordings – of which this is one – really do achieve that blissful state. Happily, the Red Book layer is also excellent; indeed, that suggests as much care is lavished on the vanilla mix as on the more exotic ones, which isn’t always the case on other labels. Back to the music, and to Organ Symphony No. 8; one of the longest – Widor later removed the Prélude – it’s heard less often than others in the Op. 42 ‘suite’. Listening to the latter it’s hard to understand why, for the tireless alchemy that began with the earlier symphonies produces gold at last. That’s not to suggest that the Op. 13 pieces are leaden – although they can easily be made to sound that way – but that an assay of Op. 42 reveals just how far Widor had come in a relatively short space of time. The clarity of utterance and enhanced mobility of No. 8 are evident from the Allegro risoluto. Lehtola articulates this movement superbly, and I doubt you’ll hear the soft, punctuating bass of the Moderato cantabile better done. The airy upper registers are just as appealing – Lehtola phrases with unrivalled sensitivity here – and the range of colours he coaxes from this instrument is just exquisite. Played like this, without a hint of bombast or prolixity, the symphony sounds fresh and vital. Even the Allegro and Variations have renewed energy and bounce. There’s no sign of the fatigue-inducing ‘wall of sound’ we hear all too often in lesser organ recordings. In fact all the big moments blossom without effort or loss of focus. Again it’s the Adagio that’s most captivating. Refined and reposeful, Lehtola invests this movement with a rare, statuesque beauty that will take your breath away. As for the sparkling garland of notes that appears to emanate from the empyrean above, it’s simply magical. The muscular Finale is taut and purposeful, and Lehtola builds powerful, resounding climaxes that never seem overwhelming or rhetorical. I will be interested to hear Joseph Nolan’s take on these two works. He has yet to record them as part of his cycle for Signum. Dominy Clements certainly rates him (review). Then there’s the admirable Hans Fagius on BIS. His recordings of No. 3 and No. 8 (BIS-CD-471 and 1007 respectively) are played on the Åkerman & Lund instruments in Katarinakyrkan, Stockholm, and Helsinki’s Kallio Church. He shapes and scales these works with great skill. The spacious, tactile recordings are excellent too. However, for uncommon levels of insight and intuition Lehtola must be the man to beat. Any caveats? No musical ones, although I do find Alba’s booklets somewhat drab and uninspiring. That’s a criticism that certainly doesn’t apply to the superior music-making and front-rank sonics of their SACDs. Then again, it’s the performances and the recording that really matter, and on that score this disc is a resounding success.